Need a ride to the airport to get home for Easter Break? 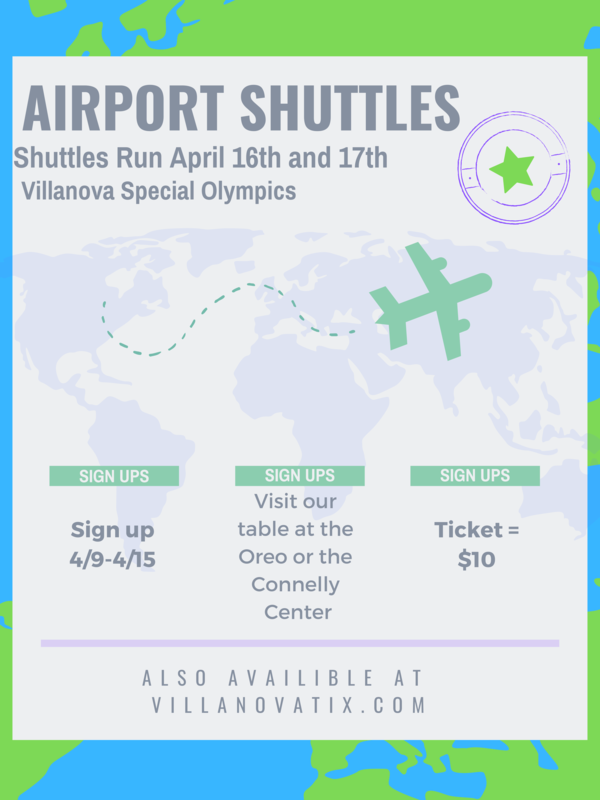 Let Villanova Special Olympics help you out! Vans will be leaving from behind the Pavilion every half hour from 2 pm-7 pm on Tuesday, April 16th and every half hour from 9 am-5 pm on Wednesday, April 17th. Tickets are $10. Pick up will be in the parking lot behind the Pavilion. Please arrive 10 minutes prior to your scheduled departure time. After you purchase your ticket, please go to https://calendly.com/fundraisingvillanovaspo/spo-v... to reserve a departure time—taking potential traffic into account—and to receive a waiver and further instructions.